UI team developing bioactive gel to treat knee injuries: Injectable gel encourages self-healing of cartilage. 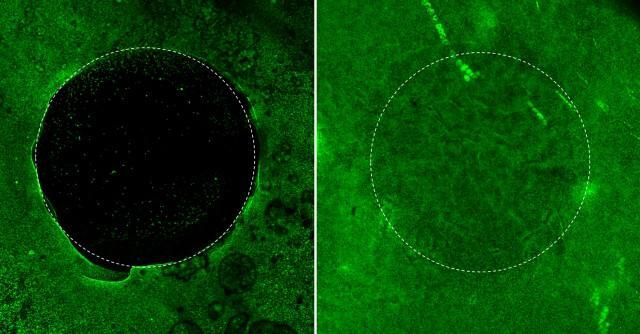 Confocal image shows migration of chondrogenic progenitor cells into the cartilage injury site in response to the stromal cell-derived factor 1(SDF1) contained in the hydrogel. Image courtesy of Yin Yu. Knee injuries are the bane of athletes everywhere, from professionals and college stars to weekend warriors. Current surgical options for repairing damaged cartilage caused by knee injuries are costly, can have complications, and often are not very effective in the long run. Even after surgery, cartilage degeneration can progress leading to painful arthritis. But a University of Iowa orthopedics research team is working on a solution with hopes it will result in a minimally invasive, practical, and inexpensive approach for repairing cartilage and preventing osteoarthritis. “We are creating an injectable, bioactive hydrogel that can repair cartilage damage, regenerate stronger cartilage, and hopefully delay or eliminate the development of osteoarthritis, and eliminate the need for total knee replacement,” says Yin Yu, a graduate student in the lab of James Martin, UI assistant professor of orthopedics and rehabilitation. Yu is first author of the study, which is featured on the cover of the May 1 issue of the journal Arthritis and Rheumatology. Martin’s team had previously identified precursor cells within normal cartilage that can mature into new cartilage tissue. This was a surprising discovery because of the long-held assumption that cartilage is one of the few tissues in the body that cannot repair itself. When a placebo hydrogel is used to fill the cartilage injury site, very few cells (green dots) migrated into the site over 12 days. In contrast, a significant number of cells migrate from the peripheral area to the center of the defect when the injury site is filled with the SDF1-containing hydrogel. Image courtesy Yin Yu. When a placebo hydrogel is used to fill the cartilage injury site, very few cells (green dots) migrated into the site over 12 days. In contrast, a significant number of cells migrate from the peripheral area to the center of the defect when the injury site is filled with the SDF1-containing hydrogel. The team also identified molecular signaling factors that attract these precursor cells, known as chondrogenic progenitor cells (CPC), out of the surrounding healthy tissue into the damaged area and cause them to develop into new, normal cartilage. One of the signals, called stromal derived factor 1 (SDF1), acts like a homing beacon for the precursor cells. In an experimental model of cartilage injury, Yu loaded the custom-made hydrogel with SDF1 and injected it into holes punched into the model cartilage. The precursor cells migrated toward the SDF1 signal and filled in the injury site. Subsequent application of a growth factor caused the cells to mature into normal cartilage that repaired the injury. The new tissue is not as mechanically strong as normal cartilage, but Yu and Martin think that mechanical loading — the type of stress that is exerted during physical therapy and exercise — might improve the mechanical properties. To translate this approach into a therapy that can be used in people, the team now needs to include the growth factor in the gel in such a way that there is a stepwise release of the attractant SDF1 followed by the growth factor. Martin and Yu have teamed up with UI pharmacy professor Aliasger Salem, to engineer that property into the gel. The team will tap Salem’s expertise on microfabrication techniques for creating novel drug and gene delivery devices, to test two technologies — nano-size plasmids carrying genetic instructions for the growth factor or microspheres loaded with the substance — to incorporate the growth factor into gel. The long-term goal of commercializing the gel as a human therapy has guided the researchers’ thinking from the start of the project, influencing the choices of materials and technologies, and prompting Yu’s participation in UI Venture School where he and several colleagues, including undergraduate student Jaison Marks, developed a business plan for the product. “We are very aware of the need to do translational research and we are always looking for the best way to develop a treatment that will be usable in humans,” Martin says. Yu and Martin plan to start animal trials within a year and, if the results are good, they hope to be ready to start human trials in about five years. The UI research team also included Marc Brouillette, Dong Rim Seol, Hongjun Zheng, and Joseph Buckwalter. The study was supported in part by grants from the U.S. Department of Defense, and the American Arthritis Society. Regenerative Orthopedics News article courtesy of Iowa Now, University of Iowa, by Jennifer Brown on 2015.04.30 with full text is available here: https://now.uiowa.edu/2015/04/ui-team-developing-bioactive-gel-treat-knee-injuries. To learn more about Metabolic Therapies in Orthopedics 2nd Edition, edited by Ingrid Kohlstadt MD, MPH and Kenneth Cintron MD, click here.